I get it! Who doesn’t want to have a seemingly flawless body like most celebrities. 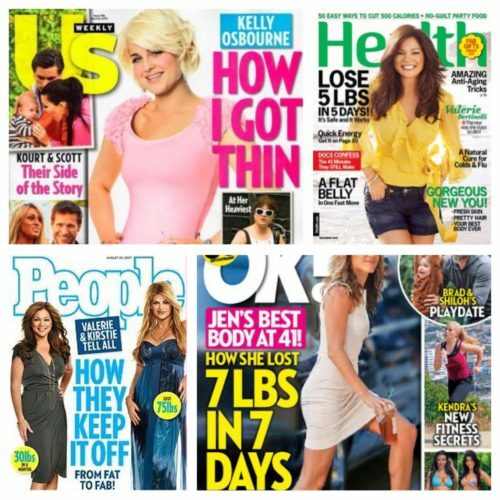 But when I’m at the grocery store checkout and nearly every magazine is touting some different celebrity’s personal diet as a way to lose a crazy amount of weight in a ridiculously short amount of time, I get mad. It even seems that most internet sites will have a link posted to a click-bait-y celebrity diet somewhere on the sidebar or footer. If you type “celebrity diet” into Google, you’ll get nearly 43 million results. Let’s do the math. Most celebrity diets are accompanied by incredible claims. 14 pounds in 14 days? That would mean, for true weight loss, cutting 3500 calories per day. For most of us, that would mean not eating anything at all and still managing to burn 2000 calories by working out – every single day for 2 weeks straight. Of course, they usually get around this by adding the words “up to” at the beginning – up to 14 pounds in 14 days – so even if you lose only 1 pound it’s still an “honest” claim. When there aren’t specific weight loss numbers given, but a more generalized “get so-and-so’s body by eating this, not eating that, and doing this workout” I’m still going to call bull-$#!*. Even if the celebrity is doing what is suggested, they have the help of a daily personal trainer and chef, and the motivation of earning their living based on what their body looks like. Their employer might even pay for those services; for instance, in order to help an actress only put on 25 pounds during pregnancy and then lose it 6 weeks after delivery so they can stick to a production schedule. These celebrities have no education or training in this area at all. Being a fitness enthusiast isn’t enough. Staying a size 2 your whole adult life does not give you license to hand out weight loss advice. We live in a society of instant gratification. We don’t want to be told that weight loss of 1-3 pounds a week is the healthiest, most successful way to lose weight, and that no magic pill, tea, wrap or singular food item or category will help or hamper our attempts, but it’s true. And if anyone else tells you otherwise, they’re lying, misinformed, and/or trying to sell you something.